Each year, we pack into the car to go pick out a Christmas tree the weekend after Thanksgiving. We always seem to pick the first one we see. The tree trimming guys clean it up, give it a fresh cut, and load it on to the top of our car. The best part about the whole experience for me is loading up on the free tree branches that are thrown into a big box after they are cut off the trees! I think that most people make wreaths with them. Not me! I use them in my classroom instead. 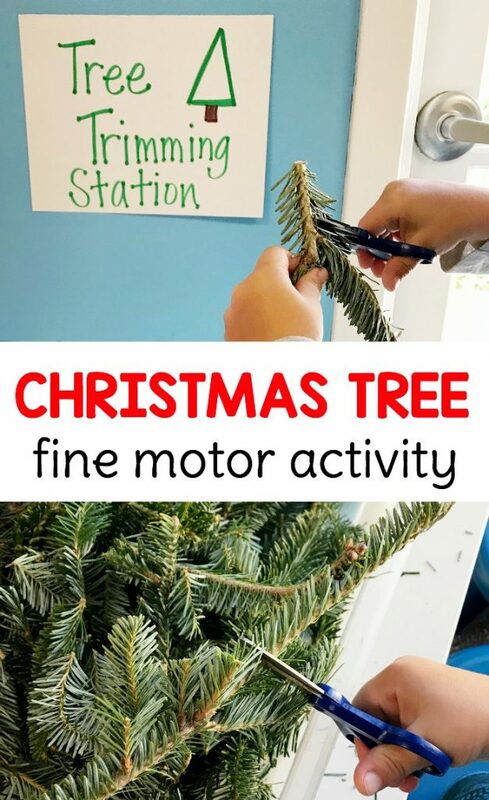 My preschoolers just loved our Christmas tree trimming fine motor sensory bin! 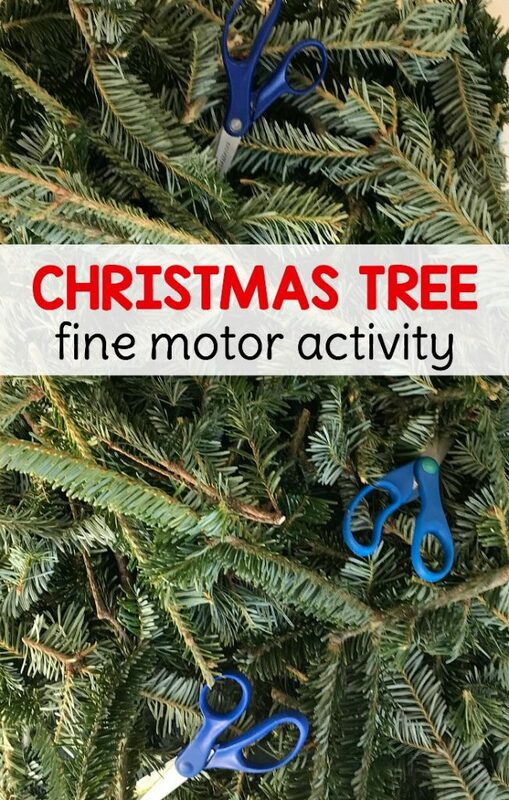 Our Christmas Tree Trimming Station was so simple to set up! I use a clear plastic bin with a lid that can latch closed as my sensory bin in my classroom throughout the year. I literally just dumped an armful of branches in it. 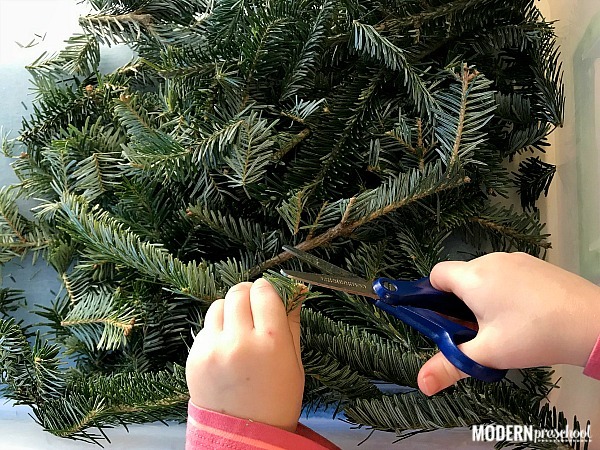 Then add a few pairs of kid-friendly scissors. Ta da! The sensory bin is ready. 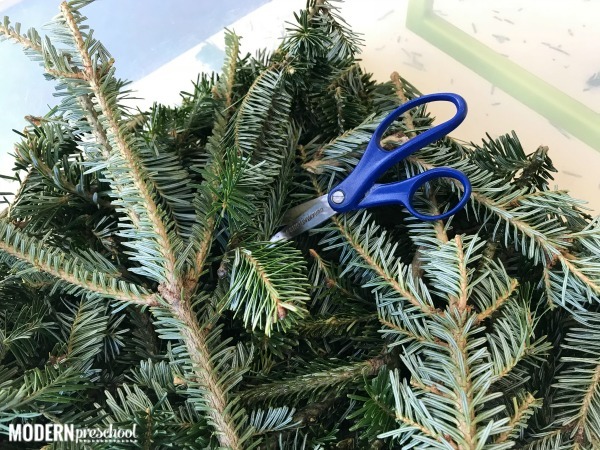 The scissors we used in the Christmas tree trimming fine motor sensory bin were our play dough scissors. I keep a set of scissors in our play dough supplies that we are kind of rough on in my classroom. This way, the scissors we use for cutting paper stay nice and sharp. The only directions I gave to my preschoolers was to be careful. I made them aware that some of the branches were too thick to cut. 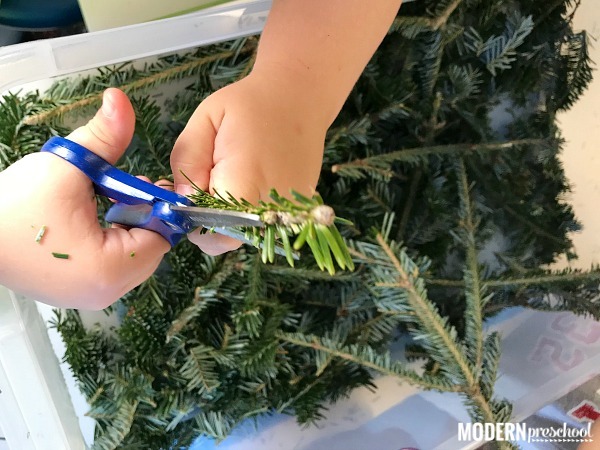 I also pointed out that it was important to hold the branches firmly when cutting. I also made a joke about how we’re trimming the tree, but not actually trimming the tree. It wasn’t funny. At all. Even after I explained it. HA! My preschoolers worked at this tree trimming sensory bin for an entire week. There were very few times during the week that there wasn’t someone sitting and trimming. I call that a huge win in the fine motor department! 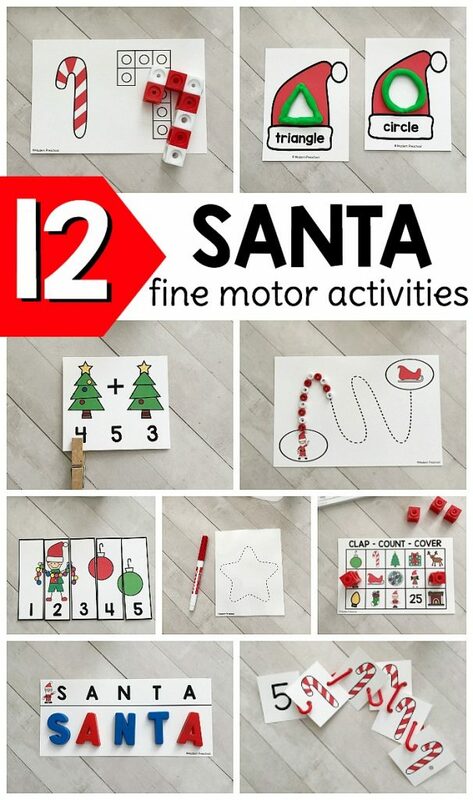 If you are looking for even more fine motor activities for Christmas, you need our Santa Fine Motor Busy Bins. Low prep activities are my absolute favorites! I like to keep things super simple so that if my preschoolers only want to play for a few minutes, it’s still ok. No one wants to end up in a temper tantrum over the amount of time put into an activity that totally flopped! I love this activity. Reminds me a little of another activity I often do. We plant grass seed in some soil, in a plastic bin. When the grass grows long, I put out with scissors so the children can cut the grass. They love it.